Every MLB baseball is manufactured in Costa Rica, yet the game itself remains an elusive myth. People have heard of the sport, but in the Costa Rican mind, it only exists north and south of the borders. When my son brought his baseball to school, kids asked to hold it. They turned it in their hands and ran their fingers along the stitching, examining the artifact. Many had never seen a one before. So when I asked my students if they knew where I could find the schedule for the national team, I wasn’t surprised by their uproar. “BASEBALL?? ?” “Do you mean soccer?” “There’s no baseball in Costa Rica, Miss!” I insisted I had read about teams that play here. “Are you SURE it wasn’t San Jose, California?” they teased. But we had read about it and knew what many Nicaraguans in this country know: there is baseball here. 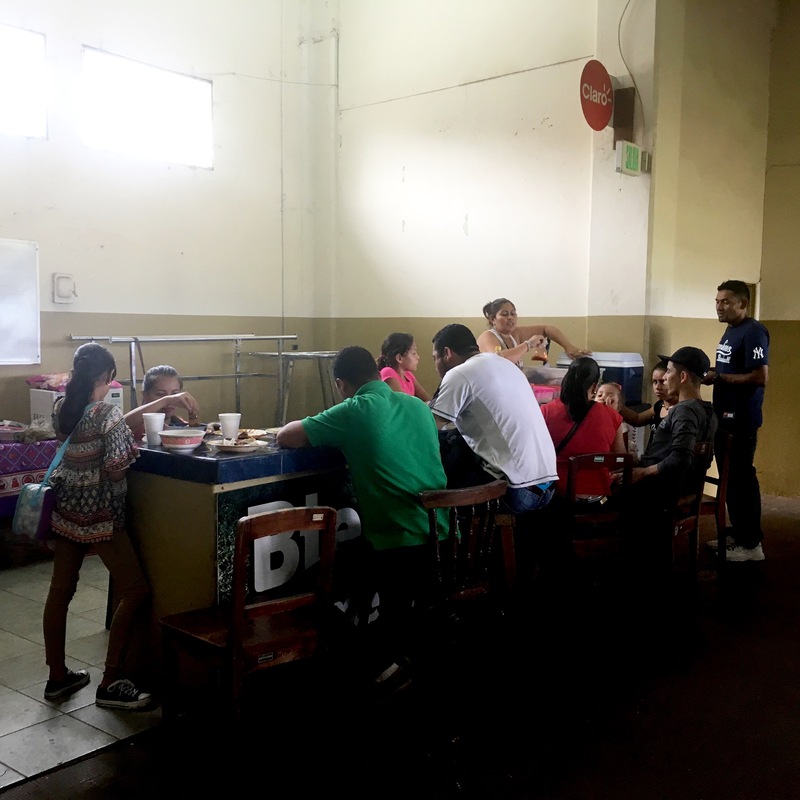 With some digging and help from US friends on the internet, we found ourselves taking a short bus ride into the swell of people who thrum through the center of San Jose on Sunday mornings. We caught a cab who drove us down deserted streets. before turning a corner where a pile of broken umbrellas sat on the sidewalk. He pulled up to Antonio Escarre Baseball Park. Not another person was nearby. “Aqui?” he asked dubiously. I nodded, but had questions myself due to the silence of the neighborhood. “Uno momento…” I said and rolled down the window and listened carefully. I could hear a few Spanish voices from somewhere, but not enough to convince me of a game. I hesitated. And then there it was—the crack of a wooden bat and a cheer. “Si! Si!” I told the cab driver, handed him the money, and jumped out of the cab. Sunday morning at the ballpark: watching the play while listening on the radio. At a small door stood an overweight man dressed all in a black t-shirt and baggy jeans with a lazy eye and a lit cigarette hanging from his mouth. “Esta entrada?” I asked him, looking at the single door behind him. He nodded, but I was unclear whether he was a gatekeeper or a panhandler. “Cuantos es un billete?” I asked him. “Mil,” he responded, the cigarette clenched between his teeth as he pulled out some paper tickets from his pocket. We handed him 2,000 colones (about $3.50 total) and walked through the door to our first Central American baseball game. The stadium seated about 200 people, but I counted only 40 sitting in the lower section. 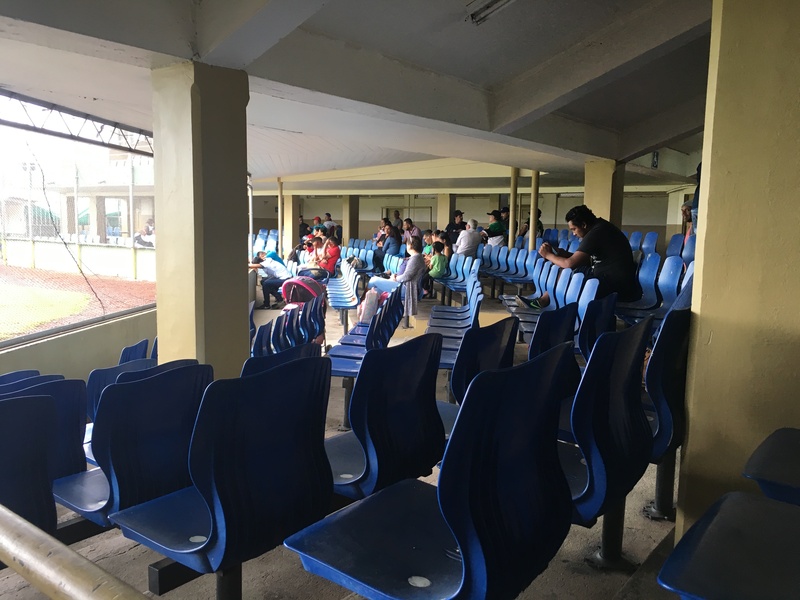 We sat in the front row, adjacent to a group of older Nicaraguan men huddled around a radio listening to the live commentary and settled into the game. The play was slow and clumsy at times, but the rhythm of strikes, balls, and hits lulled us into that comfort of familiarity. Spanish music played between innings; old men shouted at the batters; slick, suave young Cubans smelling of cologne saddled up next to the bullpens and talked to their friends. Small children ran between the seats, barefoot. A food vendor who carried a backpack and two plastic bags filled with sliced mangoes and freeze pops, paused every few steps and watched the game. The smell of food filled the air, and curious, I wandered to the back of the seating. At a tiled counter, a family sat huddled on stools around large bowls of soup. A woman dished the sopa into large glass bowls from a crockpot, stuck real silverware in them, and laid them out on the table with tortillas and rice. I couldn’t tell if this was a family picnic or if the food was for sale. “Se venta?” I asked her. “Si,” she smiled widely at me. I motioned to my son, and we saddled up to the counter to graciously receive our own bowls of homemade Nicaraguan stew filled with buttery potatoes, sweet carrots, plantains, and chunks of beef so large we had to eat them with our fingers while the broth dripped down our chins and cheap napkins fell apart in our laps. Sorry Fenway, your franks don’t hold a candle to this ballpark food! As we finished our lunches, the first baseball game wrapped up and the afternoon rain began to fall a little early. 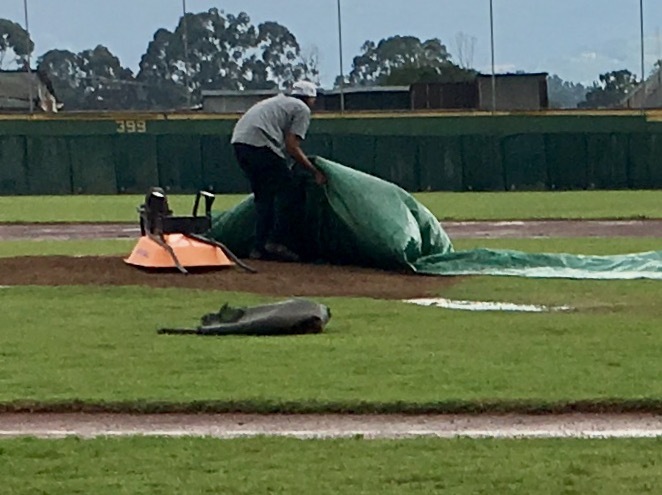 A tarp covered the pitcher’s mound and another draped over the visiting team’s dugout. 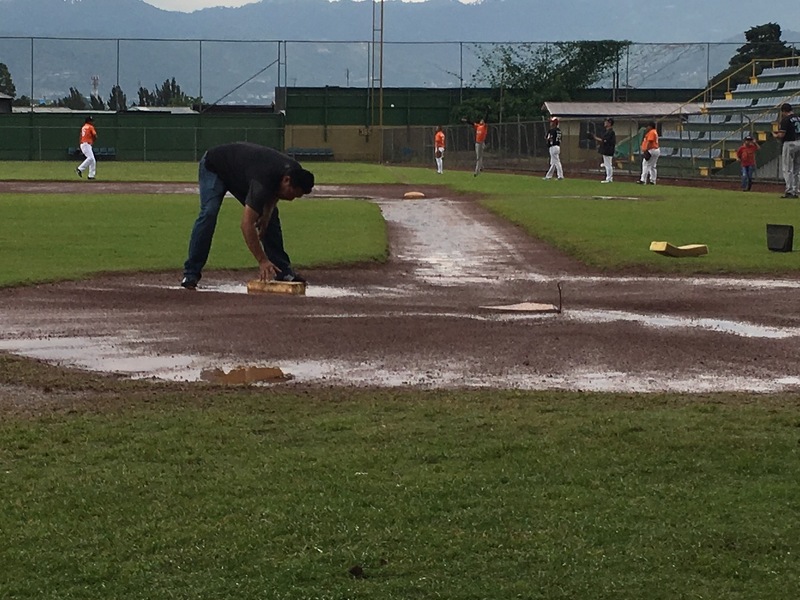 In Costa Rica, one never knows how long a rain storm will last, but this one was looking like it would be short-lived, so everyone in the stands and in the dugouts stuck around. Sure enough, twenty minutes later, the field caretakers began their work preparing the diamond for the next game. A man pulled the tarp off from the pitcher’s mound to reveal an upside down orange wheelbarrow that provided some structure to the cover. Since this was the only place on the field protected, puddles had formed all over the field. We looked over to see another man with sponges the size of a large dictionary, leaning down to mop up the batting area. Out on the baseline between second and third, players from the home and visiting teams, along with a young girl in a white dress, shoveled water and literally mopped up the field. Once satisfied with the area he was working on, the man who had sponge dried the batting area ran a line from home plate to third base and then grabbed a plastic jug with the top cut off and holes poked into the bottom that was nailed to a wooden stake, filled it with chalk dust, and walked up and down the line sifting chalk to form the baselines. He set up a wooden form that was the shape of the batting box and continued to lay the lines down. We found ourselves as engaged with watching the field preparation as we were watching the actual games. These men, landed in a country that doesn’t even make a nod at a game that pulses through their blood, have claimed it as their own, insistent that the satisfying contact of a wooden bat and the thump of a ball landing in a leather glove belong here in a quiet suburb of San Jose. They embrace the belly yell of a broad-shouldered ump and the outlandish heckles at a missed swing. They play traditional Caribbean music over the loudspeaker, congregate with their families and neighbors, and laugh loudly and jovially. They ignore the rain and make sure their footprints are indelibly placed on Sunday afternoons. On the field, players from both sides worked together to ready the field for their game. Some warmed up their pitchers and others tossed a ball to their kids while a few leaned against the stadium and talked to friends. There was so much spirit in that ballpark. So much life. Helping Dad line the field. I watched my son’s face relax and take it all in. He, too, speaks the language of baseball, and has been wondering how he landed himself in the only Central American country not obsessed with beisbol. He tapped his foot to the beat of the tango and observed the minute practices and traditions placed upon this routine. He claimed baseball as part of his identity a long time ago, as well, and like these Nicaraguans and Cubans, is insistent it move with him. We relaxed into the day, feeling at home for the first time in this land that has been beating us down with its bureaucracy and miscommunication. 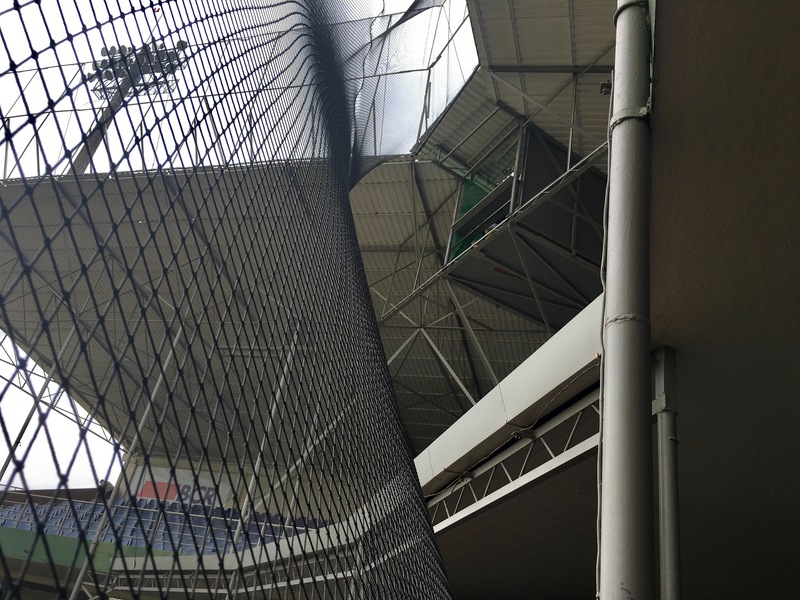 Gazing up at the press box. We had just begun to catch glimpses of normal. Two nights prior we had wandered past a little sushi bar that had the Sox/Yankees game on and we spontaneously decided to escape a downpour and guiltily ordered hot Japanese soup, sushi, and a beer that was more than our grocery bill for the week. We were high on being able to navigate freely and not be burdened and stressed, and thought that our money-hemorrhaging days might be nearing an end. But the following morning, that was all erased after another terrible, long experience at the bank, and I huddled in the back hallway of the mall, doubled over, sobbing. In fact, getting to the baseball game in San Jose had felt like an impossible task when I had woken up that morning, and I almost talked ourselves out of it. I wrapped myself in my blankets, missing my dogs and the security of home. The dirty laundry pile reminded me that I had to once again rely on somebody’s kindness to get clean clothes for the week. Everything reminded me that I have to start over almost every day. As the man lining the field turned the corner to second base, the skies opened up again. He stood and watched as his lines dissolved under the heavy drops. His shoulders dropped a little but he grabbed his tools and wandered under the safety of the roof. The tarp and the wheelbarrow came back out onto the pitcher’s mound, and the players all returned to their dugouts to wait it out, chatting and teasing one another. When the rain ended, they would begin the process again: uncovering, mopping, and chalking. Nobody knew when (or if) the second game would ever begin. This is Costa Rica: you work hard to make progress and then watch as everything disintegrates outside of your control. And while you watch carefully-laid out work dissolve in front of our eyes, you have to decide: do you pack it all up and call the game? Or do you wait it out and hold on to your conviction with tenacity and passion? Do you worry about time and money? Or do you embrace what your heart knows and loves? I sat back, tapped my foot to the catchy beat, and decided to learn from my Nicaraguan comrades. Sounds like you made the most of a static situation they call baseball in San Jose! Glad you made it. Hope every day sees improvement in your situations there. All the best from up nawth….. Previous Previous post: Tragedy or Comedy: You Pick.